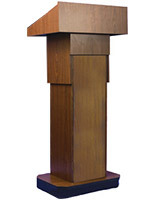 Pneumatic Height Adjust from 39" to 45"
This executive adjustable mahogany finish lectern offers 4 caster wheels, pneumatic height control and a wide slanted top with book stop. 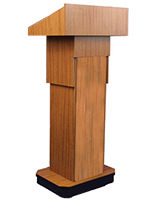 The elegant wood portable presentation podium is designed for use in high visibility public environments such as places of worship, conference halls, auditoriums and board meetings. 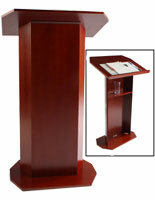 The adjustable mahogany finish lectern's rich laminate color will complement any environment. 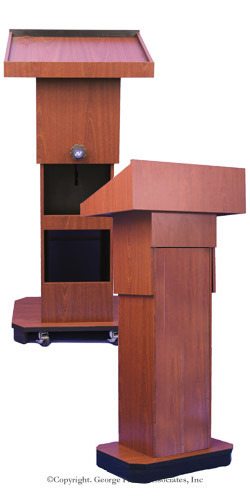 Each portable pulpit has 4 casters for easy movement with two lockable wheels for stability. 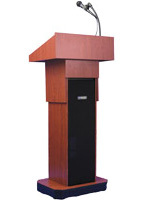 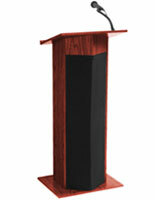 The elegant mahogany finish lectern with pneumatic height control adjusts easily to accommodate different presenters. 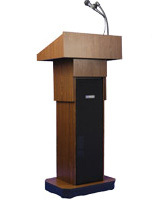 This commercial grade public speaking furniture piece is an economical choice that will provide any business, organization or institution with years of use.